Are you looking to update your outdoor living space? If so, I have the perfect list of brick patio ideas that are going to give your backyard the facelift it deserves! Yes, working with bricks does take some work and effort, but I promise you are going to love your new patio when you are finished! In this list, you are going to find all different styles, shapes, and sizes of brick patios. The hardest part is going to be picking which one you like the most! You don’t want to miss out on these. 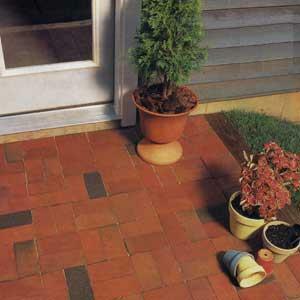 This Old House shares how you can lay a brick patio that is appealing and simple to do. You don’t have to hire a construction crew to get it done; you can do it yourself. It turned out beautiful! See it here. Apartment Therapy gives a step-by-step guide on how to install a brick patio the right way. They provide you with plenty of tips and tricks that will allow you to have a lovely brick patio for years to come. Check it out. Meena at Today shares how to create a stunning circle brick patio. It even has a firepit in the center. Imagine the relaxing nights roasting marshmallows on this patio. See how to make your own. Looking for a weekend project? 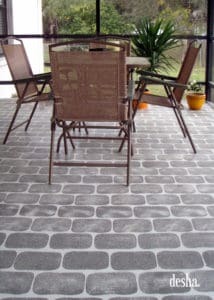 Check out the tutorial Bob Vila shares on putting in a brick patio in a couple of days. This is great for the beginning DIY’er. Take a peek. Over at Oklahoma Projects Around The House explains how he was inspired to put in a patio due to a low area of his backyard. This was something he had been thinking about and decided it was time to get to work. Look here for more information. Hunker shares the importance of planning when putting in a brick paver patio. The prep work is half the battle, and you will be glad you put in the effort when it is done. See their tips. Reclaim Renew Remodel told her friend that she had an area of her backyard that was full of sand and she wanted something done with it. They show various photos of the progress as it happened. Check it out. Brooklyn Limestone shares how to transform your backyard into a relaxing space that is great for entertainment. They installed a brick patio with a firepit. The before and after photos are amazing! See the improvements. Desha provides instructions on making a faux brick patio. If you don’t want to put in the work of placing the bricks, this could be a more natural solution for you. It turned out fantastic! Ron Hazelton put together a fantastic patio out of brick pavers. He gives you guidance on how to complete the project yourself if no time at all. Take a look! 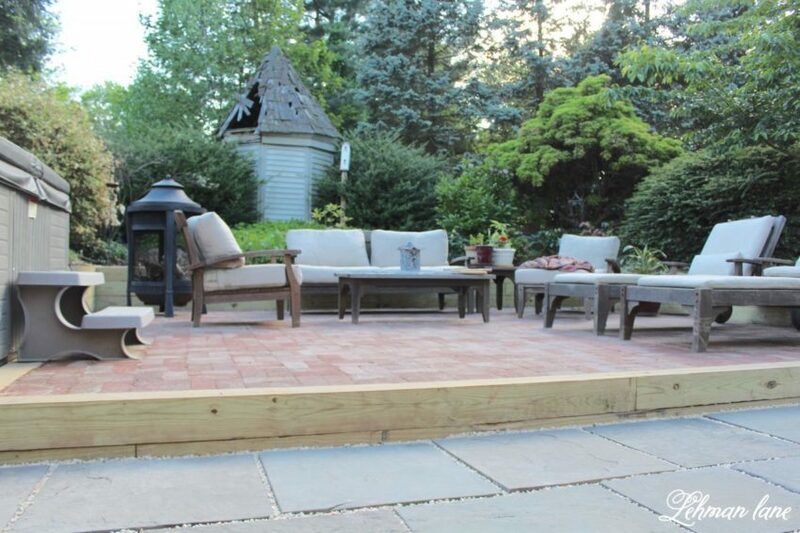 You have to check out how Lehman Lane made their backyard brick patio. They have a fantastic tutorial with lots of entertaining photos too. The patio turned out gorgeous! See what they did. Dengarden was conflicted about having a professional re-install their brick patio or doing it themselves. They opted to save the cash and get to work. The updated patio looks lovely, and now they have money left in their pockets for other things. See their tutorial. Better Homes & Gardens advises making sure you make your brick patio big enough for all your furniture as well as extra space for walking around. They offer some fantastic ideas and tricks to help you. See what they say. Young House Love shares their experience from putting in their brick paver patio. They put a lot of curving on their patio that adds a ton of character and beauty. See how they did here. HGTV gives a step-by-step guide to help you change the look of your yard with a brick paver patio. They also supply you with a list of materials needed so you can be thoroughly prepared to make your masterpiece! Check it out! Eric wrote in to Do It Yourself and shared how he put in a much-needed terrace and brick patio in his yard. He provides lots of details and photos of his progress along the way. Check out what he did. Budget Barbie got creative with making her faux brick patio using Quickrete and paver molds. I have to say; the result is gorgeous! You can add different colors to the cement too! Take a peek. The 2 Seasons is excited to share how their backyard makeover turned out. The patio is stunning! They did a great job on the pattern. See how it turned out. 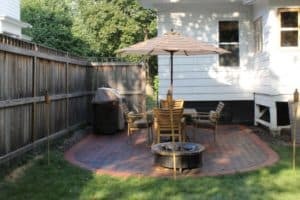 Over at Maison de Pax, she shares what the results of her patio looks like after having someone put in stamped concrete and antiqued brick. This is sure to give you some inspiration! It is exquisite. Take a look. If you are putting in a patio that needs stairs, you should check out this information by Patio Idea Guides. They give you a detailed look at what you need to get those steps appropriately installed. Have a look. Family Handyman explains how to make a patio that is going to withstand the test of time. In just a few days, some hard work and a little money you will be on your way to having the patio you have always wanted. See how. Flea Market Gardening decided to make decorated cement pavers and combine them with bricks to create a stunning patio. This is a fantastic project for beginners. Check it out. Domesticated Nomad didn’t enjoy putting in their patio, but it ended up being stunning! You have to check out their entertaining story about their experience. See it here. Crafty Chica shows you that you can paint and add vibrant colors to your bricks. Then you will have a one of a kind patio that is functional and beautiful. Take a look here. Often people want a raised patio, but they just aren’t sure how to tackle the project. Hunker explains how to make a raised patio using brick pavers. You are going to love how this looks! See it here. As you can see, the sky is the limit when it comes to brick patio ideas! You can let your imagination run wild and end up with something perfect for you. Which one is your favorite?